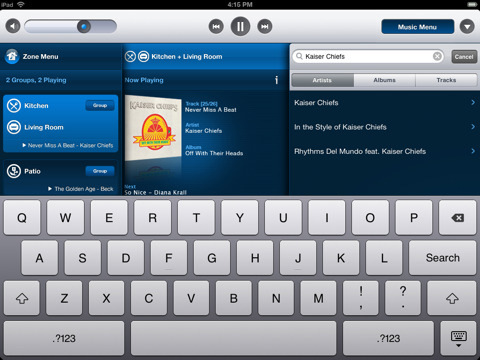 Sonos Controller for iPad is an iPad app which serves as a remote control for the Sonos music system manufactured and sold by Sonos Inc. This review was done using 2 Sonos S5 speakers and 1 Sonos ZoneBridge 100, in conjuction with the app Sonos Controller for iPad. 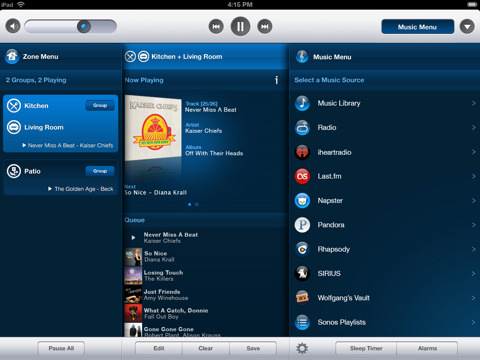 Be sure to read our review of the Sonos Controller iPhone app for an overview of the Sonos music system itself. The Sonos iPad app is very easy to use giving you a bird’s eye view over your entire system in one place. The app’s layout is reminiscent of the iPod app with familiar pause/play/back/forward buttons on the top. You can also quickly adjust the volume, mute, and drop down a seek/timer bar that contains buttons for enabling repeat/shuffle/crossfade. In landscape view, the iPad app splits into three clearly defined columns that define a clear control interface for getting to what you need very quickly. In portrait mode, you get 2 columns, sans the zone menu which you can get to with a nice flip animation. The Zone Menu on the very left lists all your zone groups and what’s being played in each one. Just tap on any zone to toggle between their active queue and now playing screens. You can easily “pause all” playing music from here. In the middle column, you have Now Playing and Queue info for the selected zone. Now playing shows your album art, track, artist, album and the track coming up next in that queue. Tap on the cover art to zoom into a larger screen where you can drag the song position, toggle repeat, crossfade and shuffle. Swipe the screen to see now playing info for other zones. The Queue window contains a list with a small thumbnail of the album art, song name and artist name. Swipe to delete any item or drag up/down to navigate the queue. Unfortunately the queue list is limited to a short window in the landscape view, although you get more real estate for this in the 2 column portrait view. For quick editing, there are also buttons to clear the list, save it as a playlist, and toggle edit mode for drag and drop reordering and deletion. The Music Menu column on the right is where you can choose your source of music. Options always include your Music Library from connected computers, Local Radio stations served by Sonos, Line-In, Sonos created playlists, plus any other music service tie into your Sonos system. Sonos supports Napster, Pandora, Rhapsody, iheartradio, SIRIUS and more for live online streaming. Each of these services have been fully integrated into Sonos. We reviewed the Napster, Pandora and iheartradio plugins which worked flawlessly. The combination of Sonos with these services makes for powerful synergy that you can’t really get with any other speaker system, letting you fully explore and get the most amount of value from both your existing music subscription plan and the quality of the Sonos hardware. The Music Library section lets you filter songs by genre, artist, album, folders and even pulls in your created playlist from external software such as iTunes or Windows Media Player. It also lets you search your music library by keyword and filter results by Artist, Album, Composer, and Track title. These search and filter menus work seamlessly as you switch between local libraries and online services. Creating Sleep Timers and Alarms is very easy to get to on the iPad app as there are buttons for them you can see at all times on the bottom. There are an abundance of settings and options in the Sonos Controller for iPad app. These include updating the music index, music service setup, adding/pairing sonos components, checking for updates, equalizer settings per zone, and much more. As with the iPhone app, again, the app does not show the star rating information from your music library. You also can’t assign star ratings to your music files as you’re listening, which would have been quite valuable. Overall, Sonos Controller for iPad is complete rework of the original iPhone version, designed to make controlling your home sound system easier and more rewarding. Providing you with the ability to see everything in one place, the iPad app is pretty close to being the perfect remote control system that tightly complements and augments your Sonos hardware. It’s a wonderful piece of software provided for free, so you can’t really go wrong. 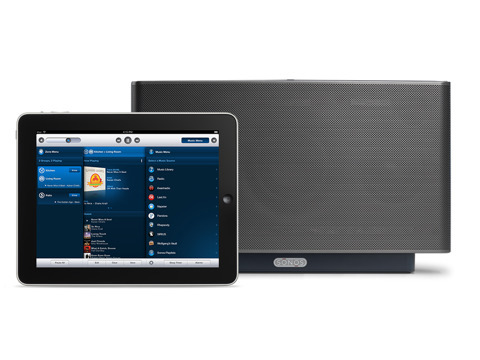 AppSafari review of Sonos Controller for iPad was written by Joe Seifi on November 21st, 2010 and categorized under Accessories, App Store, Featured, iPad apps, Music, Remote. Page viewed 7431 times, 1 so far today. Need help on using these apps? Please read the Help Page. I’ve had Sonos for almost a year, and beta tested the iPad app. Sonos is amazing, truly amazing. The ability to play different music from the same or different sources on different zones is something airplay cannot do yet. The Sonosnet is much better than the normal wifi. Sonos is not cheap, but worth every penny.